Courtyard Directions to find Shuttles at SFO and Oakland Airports | What are the different Courtyards Located? -ABC Shuttle Service Directions @ SFO and OAK - ABC Shuttle Service | SFO & Oakland Airporter | Cheapest Rates, Very Reliable, Easy Online Booking! 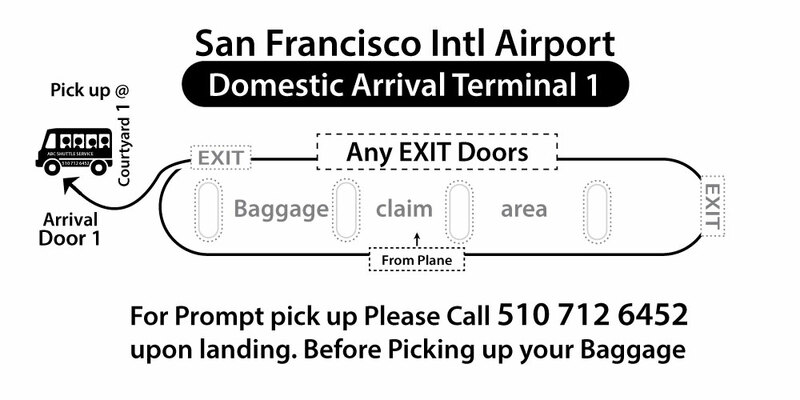 Directions at SFO and OAK Airports! Shuttle Service Pick-ups Only: Exit baggage claim doors, cross the street to the 3rd curb. Look for a bus shelter labeled #3F. At Level-#1 of Baggage Claim, go out of the sliding doors and turn Left (against the flow of traffic) follow the curb toward the end of the building until you reach a small parking lot with the sign indicating "Courtyard #1"
At Level-#1 of Baggage Claim, go out of the sliding doors and turn RIGHT (toward the flow of traffic) follow the curb to the end of the building until you reach a small parking-lot with the sign indicating "Courtyard #3"
At Level-#1 of Baggage Claim, go out of the sliding doors and turn RIGHT (toward the flow of traffic) follow the curb to the end of the building until you reach a small parking-lot with the sign indicating "Courtyard #4"
Facing outward, towards the clear sliding doors (remain inside the terminal), turn LEFT for Courtyard A, and RIGHT for Courtyard G and go down to Level 1. The small parking lot outside is either Courtyard A or G.